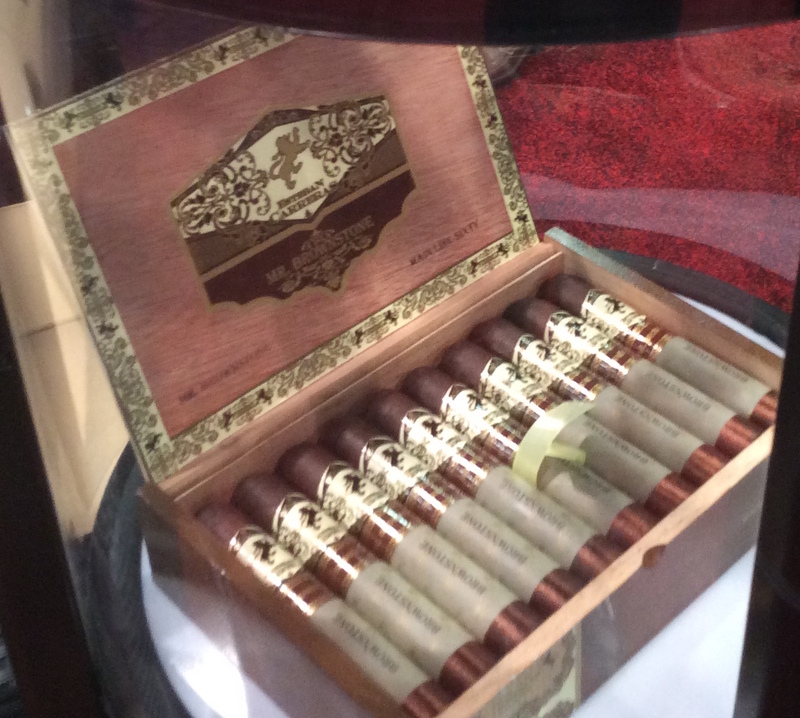 The Esteban Carreras Mr. Brownstone was unveiled at the 2017 IPCPR Trade Show. The cigar introduced a Connecticut Broadleaf maduro offering into the Esteban Carreras portfolio. The name Mr. Brownstone is a slang term for heroin. In addition, the vitola names also feature slang terms associated with heroin (i.e. Speed Ball, Main Line, and Smack). When talking to Esteban Carreras owner Craig Cunningham, the names were meant to be taken more in a satirical form. As for the cigar, the Connecticut Broadleaf wrapper used on Mr. Brownstone is one that Cunningham is quite proud of. While it’s a regular production offering, it still will be made in limited quantities in order to leverage the finite supply of the wrapper. 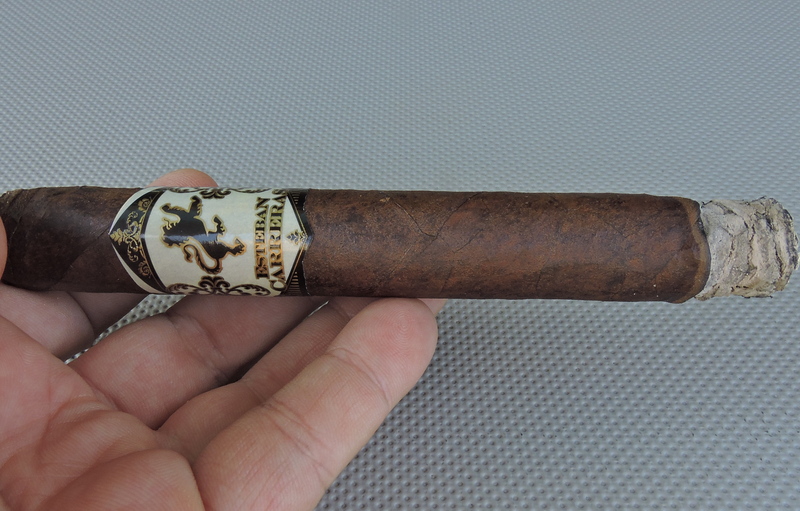 Today I take a look a the Esteban Carreras Mr. Brownstone in the “Smack” size – a classic 6 x 52 Toro. This cigar was one of the revelations of the IPCPR. It’s a powerful Connecticut Broadleaf that delivers excellent flavor and one that I found quite satisfying. With over a decade in business, Esteban Carreras is no longer the new kid on the block. The cigars have become the staple of many retail humidors nationwide and internationally. The company has its own factory in Estelí, Nicaragua and operates its own direct sales force. Cigars such as the Esteban Carreras Habano Maduro, Esteban Carreras Diez Anos, 187, and 5150 have landed on previous Cigar Coop Cigar of the Year lists. The company is named after Esteban Carreras who was a freedom fighter in Cuba who helped get people out of Cuba as Castro was coming into power. Without further ado, let’s take a closer look at the Esteban Carreras Mr. Brownstone Smack and see what this cigar brings to the table. 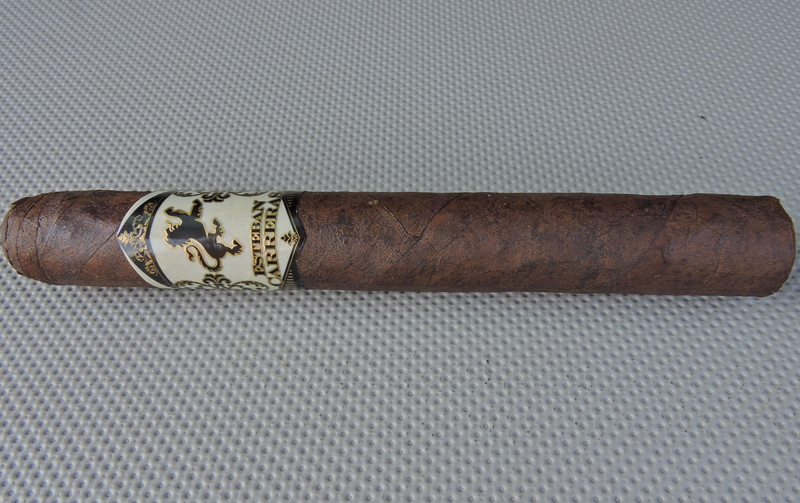 In addition to the Connecticut Broadleaf wrapper, the blend consists of an all Nicaraguan filler and an Ecuadorian Habano binder. As mentioned, the three sizes are also slang names associated with the heroin industry. Each size is packaged in 20-count boxes. 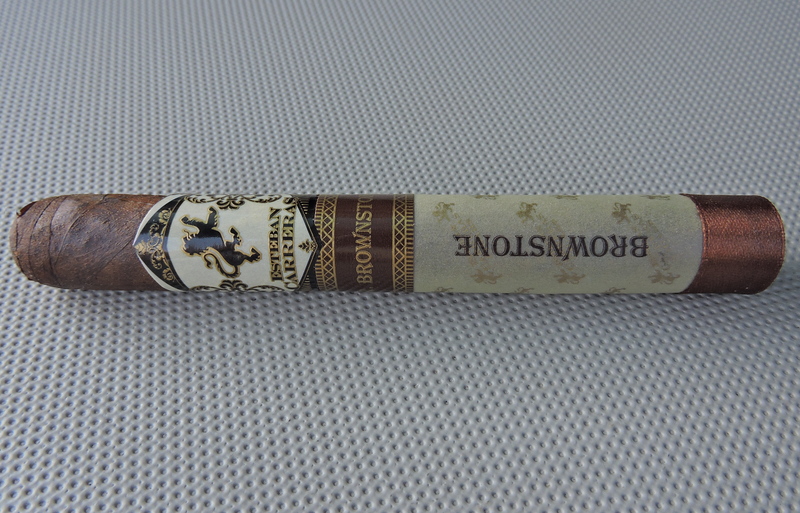 The Connecticut Broadleaf wrapper over the Esteban Carreras Mr. Brownstone Smack had a rich brown color. Upon closer examination, some darker mottling could be seen on the surface. This wrapper was definitely on the oily side. The surface of the wrapper was slightly bumpy. There were also some thin visible wrapper seams and thin visible veins present. Mr. Brownstone features a primary band, a secondary band, a parchment wrap that covers the lower half of the cigar, and a brown ribbon. While the covering may seem excessive, it does serve a purpose to protect the cigar and I found it aesthetically pleasing. The primary band has an ivory background. On the center of the band is a black Esteban Carreras lion logo with gold trim. Just below the lion is the text “ESTEBAN CARRERAS” – also in a black-colored font with gold trim. The remainder of the band has gold and black adornments. As mentioned, there is a parchment wrap covering the lower part of the cigar. There is a pattern of gold-colored Esteban Carreras lion logos. On the center of the wrap is the text “BROWNSTONE” in brown-colored font. A metallic brown colored ribbon covers the lower portion of the wrap. The secondary band of the cigar sits on the upper portion of the wrap. It is brown in color with gold font. The text “MR. BROWNSTONE” is on the center of the band. The upper and lower part of the band have a pattern of gold adornments. Because the secondary band and ribbon are affixed to the parchment wrap, I had to remove all three entities, leaving the primary band on. I then proceeded to the pre-light draw phase. The cold draw delivered a mix of coffee, earth, and a tingly pepper note. I considered this a satisfactory pre-light draw. At this point, I was ready to light up the Esteban Carreras Mr. Brownstone Smack and move on to the smoking phase. The Esteban Carreras Mr. Brownstone Smack started out with a mix of cocoa, coffee, earth, citrus, and red pepper notes. Sometimes I refer to a combination of cocoa/chocolate and coffee as mocha, but with this cigar I found the notes to be quite distinct as opposed to blended. Early on the cocoa, coffee, and earth notes became primary while the citrus and pepper notes were secondary. On the retro-hale, there was an additional layer of red pepper. For the first third, I found the cocoa notes to be the most prominent of the primary notes. Toward the start of the second third, I found the cocoa, coffee, and earth to be more on equal ground. During this phase, I also found the citrus notes popped into the forefront from time to time. The last third of the Mr. Brownstone Smack saw a similar pattern to the second third. The difference is I found the pepper notes increased in intensity on the tongue; however these notes didn’t overpower the blend. This is the way the Esteban Carreras Mr. Brownstone Smack came to a close. The resulting nub was firm to the touch and cool in temperature. While the Mr. Brownstone Smack was able to maintain a relatively straight burn path and relatively straight burn line, I did find this cigar needed some touch-ups along the way. The resulting ash was a light gray color. This was an ash that was on the firm side. Meanwhile, the burn rate and burn temperature were ideal. I found the draw of the Mr. Brownstone Smack to be on the open, but not loose side. This was a cigar that produced an abundant layer of smoke throughout the smoking experience. I found the Mr. Brownstone Smack to be a powerhouse offering in the Esteban Carreras portfolio. Strength-wise I found this cigar to be full right out of the gate. There was a slight increase in strength along the way before it leveled off. As for the flavors, I found them to be medium to full-bodied. Toward the last third, there was a slight spike in intensity and the Mr. Brownstone Smack moved into full-bodied territory. When it came to strength versus body with the Mr. Brownstone Smack, I found the strength had the edge. While I didn’t find the Mr. Brownstone Smack to be the most complex of cigars, I still found it to be very satisfying. In addition, I didn’t find the fact that the strength had the edge in this cigar to be a negative. I found this to be a cigar ready to smoke out of the box. At the same time, I believe longer term this cigar has some serious aging potential, and I’m curious to see what the strength level will be over time. Given that this is a stronger cigar, it is one I would steer toward a more experienced cigar enthusiast. As for myself, this is a cigar I would smoke again – and it’s worthy of box purchase consideration. I’m disappointed to see that this is a cigar that is rated as highly as it is since most shops in my area (including the one I work for) will not be carrying the cigar because of the name alone. Pittsburgh – and several surrounding areas – have been hit especially hard by the heroin epidemic that is sweeping our country. While Mr. Cunningham, and plenty of other well meaning people, may find these names to be satirical, there are too many in the local communities where I – and a few other shops – operate that have lost loved ones to heroin (either to overdoses, or losing the person they used to be to a constant battle with addiction). I am a fan of Esteban Carreras and was excited when rumors of new product were swirling. But I really hope that they reconsider their branding of this product. Otherwise my owner and I have decided not to carry this product as have several other shops that carry Esteban Carreras products. In regards to product branding, that is entirely up to the consumer and the retailer on how each wants to judge it. We assess a cigar based purely on merit, performance and now most recently (as of December 2017) value.